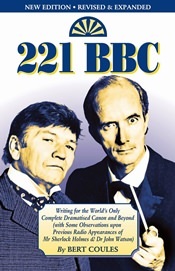 221 BBC is a detailed but informal look behind the scenes of the complete Sherlock Holmes project, both the Conan Doyle dramatisations and the four follow-up series of Further Adventures. Originally published as a slim monograph, this new edition is completely updated, expanded to nearly 300 pages and has a new foreword by Clive Merrison. Published in the USA by leading Sherlockian specialists Gasogene Books and lavishly illustrated, the book includes many script extracts (including some from unproduced episodes), full cast and crew credits and the complete script of the Further Adventures episode The Abergavenny Murder. Click here or on the cover image to order 221 BBC from the Gasogene Books website.